Cut Out Sugar Cookie Recipe - This sugar cookie recipe is an heirloom family recipe used for generations. A simple sugar cookie recipe that makes perfect roll out sugar cookies that are perfect for decorating. Line baking sheet pans with parchment paper or baking mats. Cream together the butter and granulated sugar until light and fluffy, about 3 minutes. Add in the eggs, one at a time, fully incorporating after each addition. Then, add in the vanilla extract. Whisk together the flour, baking powder, baking soda, and the salt in a large bowl. Slowly incorporate the flour mixture into the butter and sugar mixture, making sure to mix well as combining and taking care not to over mix as it causes tough cookies. Dust countertop area lightly for rolling sugar cookie dough using confectioner's sugar. Divide the sugar cookie dough in half and roll to desired thickness. 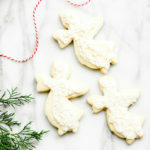 Cut sugar cookies with preferred cookie cutters, working dough back together and rolling and cutting until all dough has been use and placed onto prepared baking sheets. Place your baking sheets into the freezer for 15 minutes to prevent the dough from spreading as much while baking. Preheat the oven to 350º F as your sugar dough is in the freezer. Transfer baking sheets straight from the freezer to the oven for baking. Bake cookies until lightly golden brown, about 12 minutes. Remove from the oven and allow to cool completely before decorating, if desired.